England coach Eddie Jones has been less than impressed with how his team has been treated in Australia. EDDIE JONES HIT out at the Australian media, with the England coach angry at “demeaning and disrespectful” treatment his team has received down under. England continued their unbeaten run under coach Jones in Brisbane on Saturday, withstanding a Wallabies fightback to win 39-28 in the opening Test. 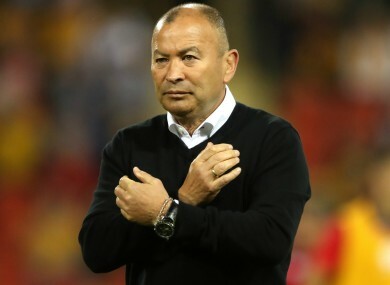 But as the Six Nations champions celebrated a seventh win in as many games following Jones’ appointment, the former Wallabies boss was unhappy with the treatment of England in his native Australia. Angered by a question from former Wallabies flanker Steve Hoiles in the post-match news conference, as well as a television advert – headlined by ex-internationals Tim Horan and Phil Kearns – dismissing England’s chances of a series win in Australia, Jones did not hold back. “You’ve seen the promotions and the kind of questions we get. It’s quite demeaning and disrespectful to the team, so we’re not going to let this opportunity pass,” he said. “Without a doubt we’ve been disrespected. You get that sort of ridiculous question from Hoiles. Jones, whose England head to Melbourne for the second Test on Saturday, added: “There has been a row of ex-Wallabies so far – you’ve had Hoiles, you’ve had Simon Poidevin and you’ve had Kearns. “David Campese has got to be somewhere. He’s coming for sure. I can see next week something is going to happen. “It’s not important for us to earn respect, it’s important for us to win. That’s the only thing. This is about us, not about Australia. Email “Jones scathing of England's 'disrespectful' treatment in Australia”. Feedback on “Jones scathing of England's 'disrespectful' treatment in Australia”.